Touch 'n Seal provides up to three systems for applying many of its two component, low pressure, spray-applied or pour-in-place polyurethane foam systems. They are supplied as disposable cylinders for the Touch 'n Seal CPDS Series 2, disposable foam kits or refillable cylinders for high volume and OEM applications. Regardless of the system being used, the components are mixed and applied with the patented applicator to produce rapidly curing rigid polyurethane foam for air sealing and other uses. The CPDS Series 2 or Constant Pressure Dispensing System offers the convenience of disposable foam kits with the efficiency of bulk systems. 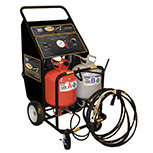 It is a portable, constant pressure spray foam dispensing system designed to dispense Touch ‘n Seal 2-component polyurethane spray foams up to 2-1/2 times faster than our disposable foam kits. With minimal investment and training the CPDS Series 2 offers an ideal opportunity for business start-up or service expansion. 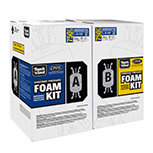 Touch 'n Seal's disposable foam kits provide excellent portability without sacrificing functionality. The easy-to-carry kits come complete and ready-to-use with everything needed to get the job done. Designed for high volume operations, Touch-N-Seal refill systems are available in 17, 60 and 120 gallon sizes for a variety of two-component polyurethane spray foam systems. 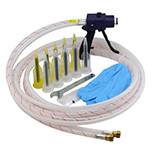 Touch 'n Seal offers a variety hoses, nozzles and kits that work with the innovative Applicator Gun to keep your operation running smoothly and efficiently. 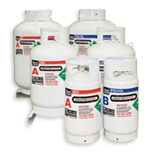 For cold weather usage, we also offer a full line of heating accessories to help maintain proper chemical temperature.